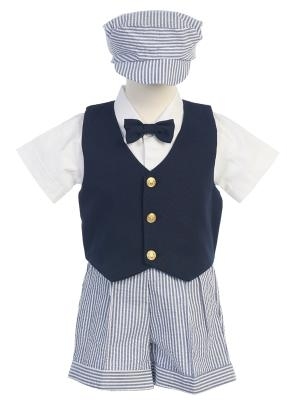 This outfit is popular for beach and outdoor weddings and is perfect for cruise ship formal meals. 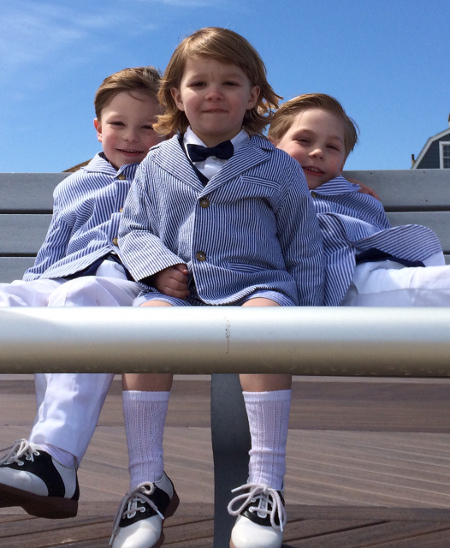 This top quality boy's suit combo includes a crisp cotton seersucker jacket with navy blue and white stripes, a pair of 100% cotton long white slacks, a navy blue long sleeve dress shirt and a long white tie. A best summer seller by Lito. Made in USA. 100% cotton suit and pants. The shirt is 65% cotton and 35% polyester. 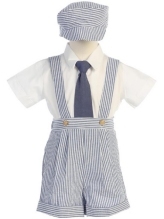 Allow 3 - 4 business days processing time prior to shipment for this suit.